The GPL-31T is a high performance, Mil-Spec, AGM battery, produced in the United States. Due to the Lifeline Battery’s quality construction, it has an industry leading 2% per month self discharge rate at 77°F (25°C), compared to 10%+ for conventional batteries. Coast Guard approved, DOT Haz Mat Exempt, and longer lifespans than conventional batteries. Warrantied installations include marine, yacht, and other seafaring applications. 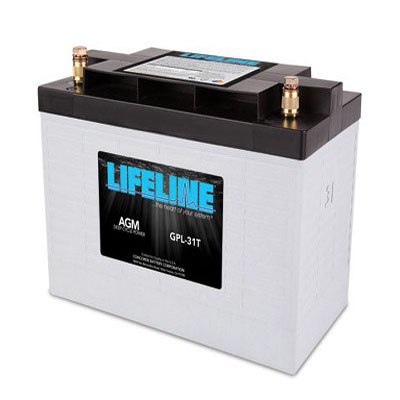 The Lifeline AGM Battery GPL-31T is a high performance, Mil-Spec, AGM battery, produced in the United States.&nbsp; Due to the Lifeline Battery’s quality construction, it has an industry leading 2% per month self discharge rate at 77°F (25°C), compared to 10%+ for conventional batteries. Coast Guard approved, DOT Haz Mat Exempt, and longer lifespans than conventional batteries.&nbsp; Warrantied installations include marine, yacht, and other seafaring applications. As the preferred AGM battery choice of more than 150 OEM’s around the world, Lifeline is the Best Battery you can Buy! Lifeline Batteries are perhaps best known in the marine industry by those with mission critical applications like professional anglers, long distance cruisers and yacht captains seeking value and reliability. These Lifeline Battery owners consistently experience a working life-span between 5-8 years for their AGM batteries. Often operating in extreme latitudes, from equatorial heat to polar ice, the weather is no match for the toughness of a Lifeline Battery. As reported back to us directly from Yacht manufacturers, marine distributors, and end users alike. Lifeline Batteries function to stickered specifications while operating in the harshest of equatorial climates. As our customers present us with applications nearing the poles, they find comfort knowing that our batteries are not damaged by extreme subzero temperatures either. There are many factors that contribute to the overwhelming success of Lifeline AGM Batteries. Manufactured entirely by hand, from start to finish, across the whole of the battery line, we at Lifeline already know our consumers will get batteries built with care, to Military Specifications, as rigid QA checks every step of the process to ISO specifications. All raw materials, lead, copper, brass, and battery components are the highest quality available, and sourced locally. Finally, Lifeline Batteries are engineered to a level second to none. Our exclusive proprietary manufacturing processes then render a battery with the lowest internal resistance on the market. Quality Construction, Quality Materials, and Quality Engineering equals highly successful results. It’s simple: Lifeline Batteries provide ample cranking amps for all RV applications, industry leading reserve capacities, two to three times the life-cycles and a virtually non-existent defect rate. Aircraft class cell construction; lowest internal resistance that provides high repeated cranking current. When discharged to the BCI recommended 50%, Lifeline batteries provide nearly 1000 life cycles, which is significantly more than other technologies. Other flooded and gelled batteries fall between 300 to 450 life cycles at 50% discharges. Lifeline Batteries facilitate a significant increase in recharge rate, with amazingly high current limitations when you properly regulate the charging voltage. Customers charge 100ah batteries with 500amp chargers routinely. Much better charge retention rate when compared to flooded and gelled technologies. Lifeline Batteries self discharge around 2% per month vs. 10% for other batteries. With proper charging, Lifeline Batteries require no maintenance. Lifeline Batteries do NOT accept addition of water nor do they corrode their surroundings. During normal charging conditions there is no dangerous gassing. Lifeline battery construction has passed extensive military shock and vibration requirements. Lifeline provides safety even during severe overcharging as the batteries produce less than 2% hydrogen gas by volume (4.1% is required for flammability in air). Lifeline batteries currently installed in Marine and RV applications are providing a life span ranging from 5 to 8 years under routine use. Daily and intensive applications also see 3-8 years of use depending on depth of discharge. Lifeline Batteries offers one of the best warranties in the industry with our 5-year pro-rated and a one-year free replacement. Building a battery bank that will adequately meet your power consumption needs requires careful consideration. It may help to first develop a punch list of your power requirements, space allocation, charging protocol, weight restrictions, safety considerations and budget planning (long term). Once you have selected and installed your battery bank (s), there are some simple tips to insure a long cycle-life. After you have discharged your batteries, be sure you fully recharge them. You know your Lifeline Batteries are fully charged when you can no longer push more than .5amp/ 100amp/hr into them. Never let your batteries rest in a discharged state as they will begin to sulfate. Make sure that all battery charging devices are dialed in as close as possible to our recommended charging values. You should always fully charge your batteries prior to storing them. We recommend putting a maintenance charge on your batteries every 6 to 8 weeks for best results. Checking the open circuit voltage should be step one. A fully charged new 12v Lifeline Battery will have a resting voltage of 12.9v or greater. If the battery won’t return to a full charge through normal charging procedures it may be sulfated and require a conditioning charge. (see technical manual) If the battery displays a strong voltage, but significantly drops under a load, it may have been overcharged causing water loss. A load test and/ or capacity test can determine how severe the damage may be from overcharging. Most battery chargers need to see a nominal voltage of 8.5v before functioning properly. If your batteries have been discharged below this level, you may need to utilize a manual charger that can function no matter how low the battery voltage. Capacity ratings are after 15 cycles and are at 77° (25°) to 1.75 volts per cell. GPL-4CT & GPL-6CT are available (special order) with Marine Terminals. When required, all batteries are supplied with silicon bronze bolts, nuts & washers necessary for installation. All part numbers include carrying or lifting handles. Be the first to review “LifeLine AGM Battery – GPL-31T” Click here to cancel reply.